Licenses can be purchased from our customer page (signup is required). There are two types of Duplicacy licenses: A personal license can only be installed on home computers, and can only be used to back up personal documents that are not related to for-profit activities. A commercial license has no restrictions and can be installed on any computer to back up any files. 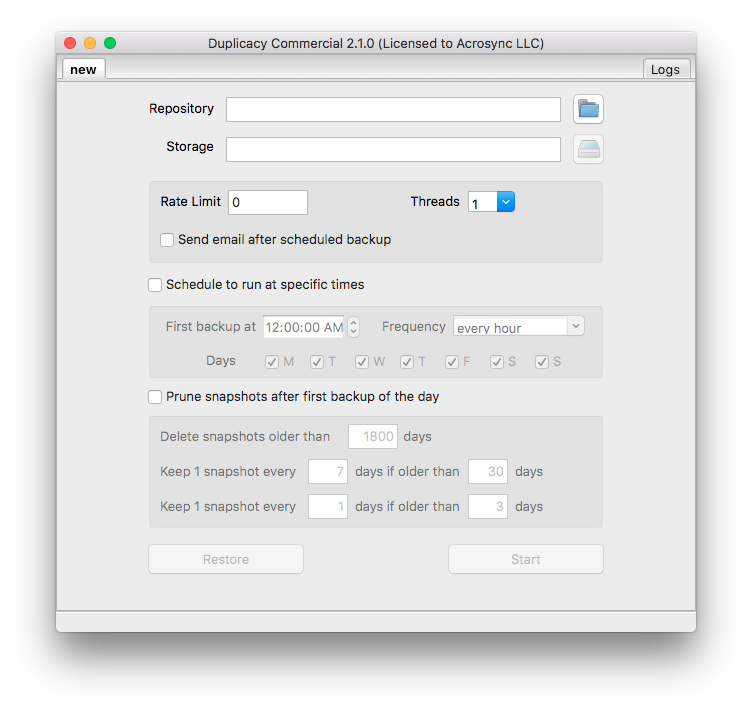 Since version 2.1.0, Duplicacy supports multiple backup jobs. You can right click the tab bar to activate the job management menu to create new jobs or delete existing jobs. Alternatively, you can also click the Duplicacy icon in the menu bar (for macOS) or right click the Duplicacy icon in the system tray (for Windows) to access the same menu. 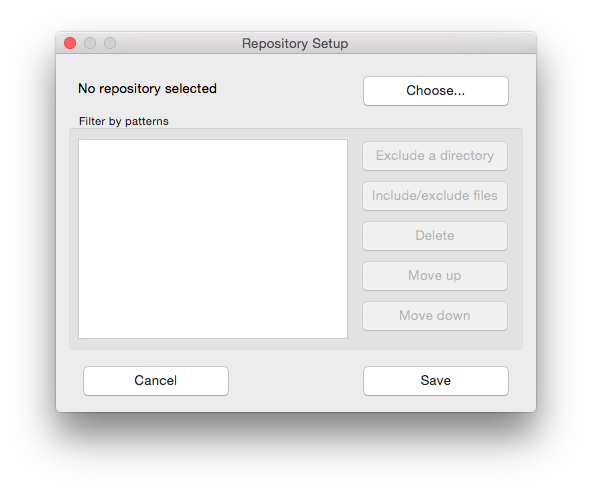 With this dialog, you can click the Choose... button to select the repository. If you intend to back up everything in the the repository, click the Save and you can jump to the next section on storage setup. Otherwise, you can add exclude/include patterns so that only certain files or directories will be backed up. For instance, if you want to exclude all *.log files except the ones under the dir1 directory, the patterns should be +dir1/*.log and -*.log, in that order. If you decide to use a local disk for the storage, you just need to select a directory using the system default dialog. 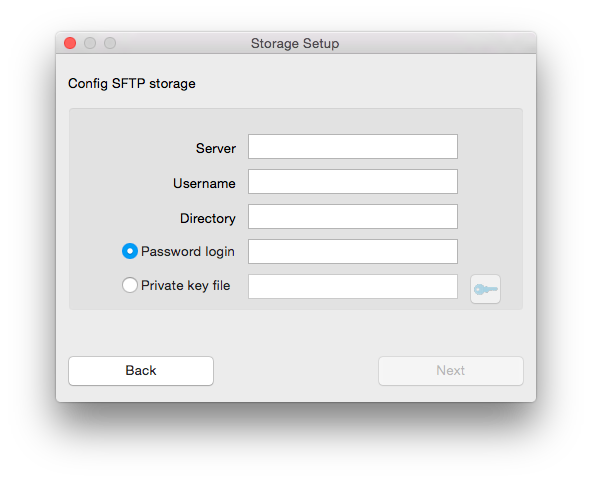 For the SFTP storage, the server address, the username, and the remote directory must be specified. If a customer port other than the default 22 is used, enter the server address in the format of host:port. If the SFTP server supports password login, the password used to log into the server must be supplied. If public key authentication is required, you can click the button next to the private key file text field to select the private key file (which cannot have a blank passphrase due to a limitation of the underlying go SSH library). 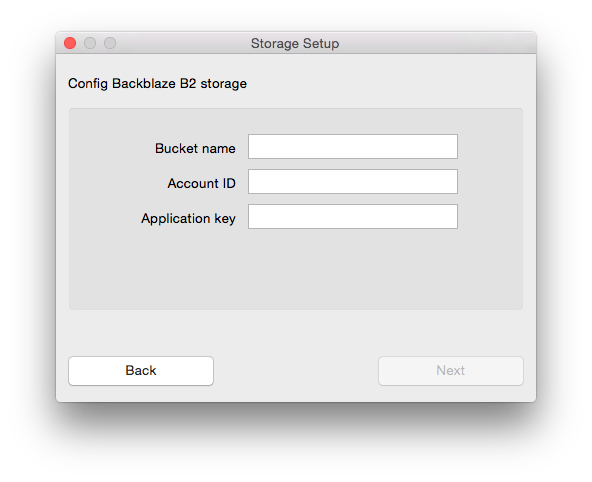 For the Backblaze B2 storage, the bucket name, the account id, and the application key must be provided. The Backblaze B2 storage is currently the only storage that supports multithreaded uploading. Once the storage is chosen, a combobox on the configuration page will become visible to allow you to select the number of uploading threads. Please note that if you back up multiple repositories to the same B2 bucket, the lifecyle rules of the bucket is recommended to be set to Keep all versions of the file which is the default one. The Keep prior versions for this number of days option will work too if the number of days is more than 7. To use the Amazon S3 storage, you must first specify the bucket name. The directory is optional. The access key and the secret key must also be provided. An access token file issued by Google is needed to access Google Cloud Storage. 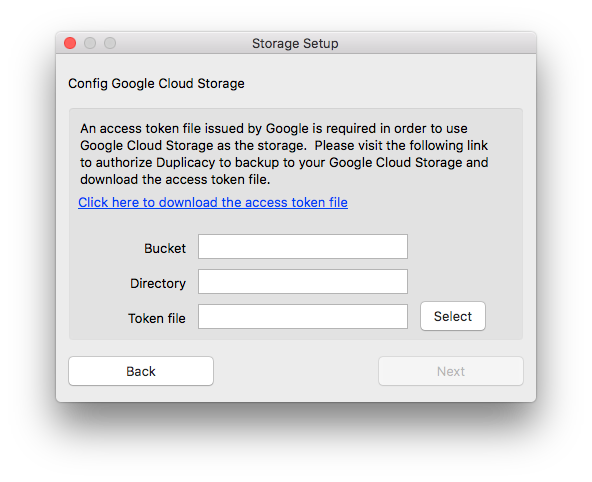 The access token file can be obtained by granting Duplicacy the required permissions to access your Google Cloud Storage files, or by downloading a service account credential file directly from Google. For the Azure storage, enter the container name and the access key. 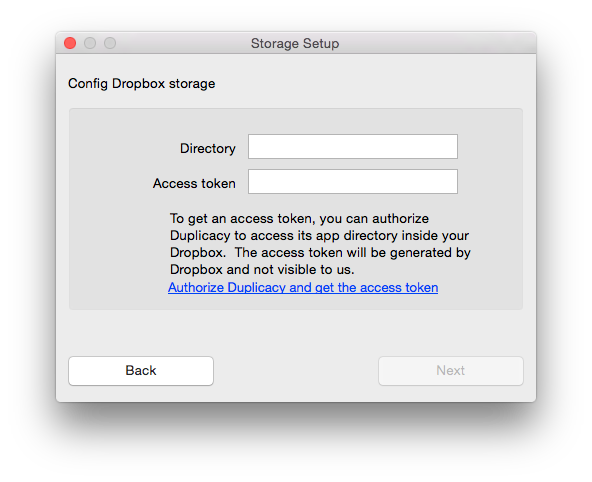 To use Dropbox as the storage, enter a directory name and the access token. You can obtain the access token by authorizing Duplicacy to access its app folder inside your Dropbox. Note that the access token obtained this way is not visible to us. To use Google Drive as the storage, you must acquire an access token file by authorizing Duplicacy to back up to your Google Drive. After the access token has been downloaded to your computer, enter the local path where the access token file is stored, as well as the directory in your Google Drive used as the storage. 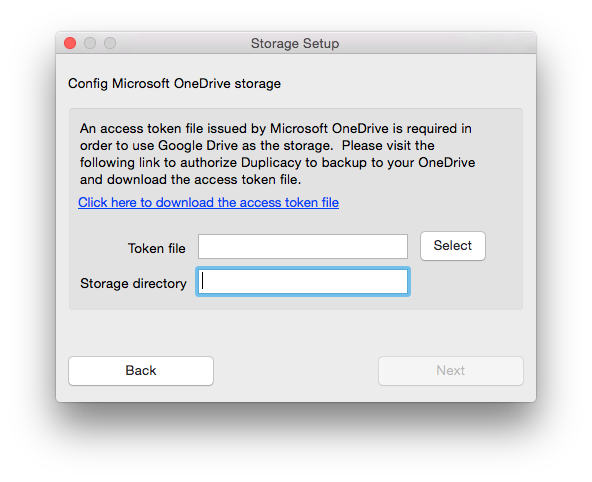 To use Microsoft OneDrive as the storage, you must acquire an access token file by authorizing Duplicacy to back up to your OneDrive. After the access token has been downloaded to your computer, enter the local path where the access token file is stored, as well as the directory in your OneDrive used as the storage. To use Hubic as the storage, you must acquire an access token file by authorizing Duplicacy to back up to your Hubic stroage. After the access token has been downloaded to your computer, enter the local path where the access token file is stored, as well as the directory in your Hubic used as the storage. 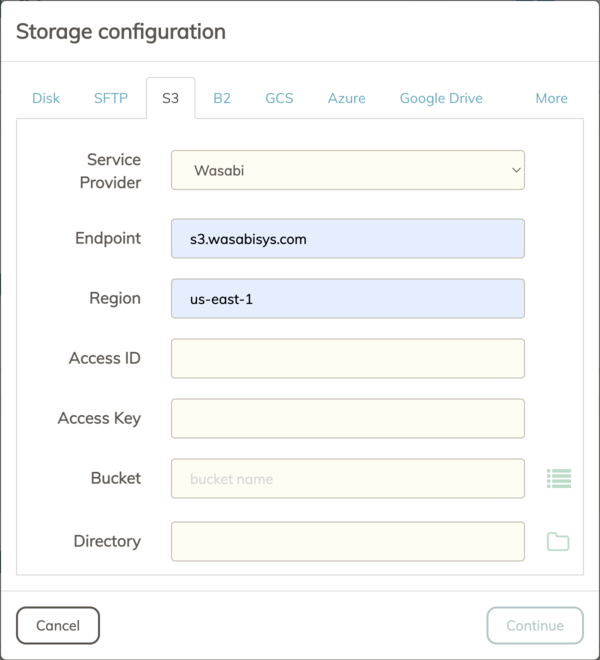 Wasabi is a S3-compatible cloud storage service, so you will see a configuration page very similar to that of Amazon S3 with the region and endpoint automatically filled. DigitalOcean Spaces is another S3-compatible cloud storage service. 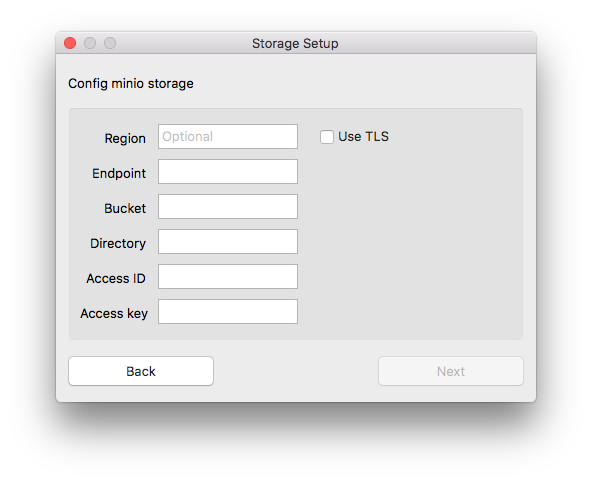 The minio storage backend allows Duplicacy to back up to any public or private S3-compatible storage. On this page, if you want to encrypt the storage, select a password and enter it twice. If you leave the password empty, the storage will not be encrypted, and anyone else who can access the storage can access your backups too. On this dialog you can also select the repository id used to identify the repository. Duplicacy will generate a default one for you from the host name of the computer, the username, and the base of the repository directory. You can also enter a different one in the input box, or select another one that already exists in the storage (if the storage has already been initialized before). If the storage has already been initialized with encryption enabled, then you will also need to input the correct password. After the storage is set up, you are now back at the main window, with the two text fields, Repository and Storage, properly populated. You can then decide if you need to limit the upload speed. If so, enter a number indicating the maximum upload speed (in kilobytes/sec) in the Rate Limit text field. If no throttling is required, you can leave the text field empty, or filled with a 0, both of which indicating that there is no rate limiting. At this time you can start the backup operation manually by clicking the 'Start' button. However, if the Schedule to run at specific times checkbox is checked, Duplicacy will start the backup at the scheduled times, which are determined by the first backup time of the day, the backup frequency, and the selected days of the week. Please note that if the last backup time of the day has passed, the next backup will start on next day (if the corresponding day of the week is checked) at the time specified by the first backup time of the day (not the next time determined by the backup frequency). 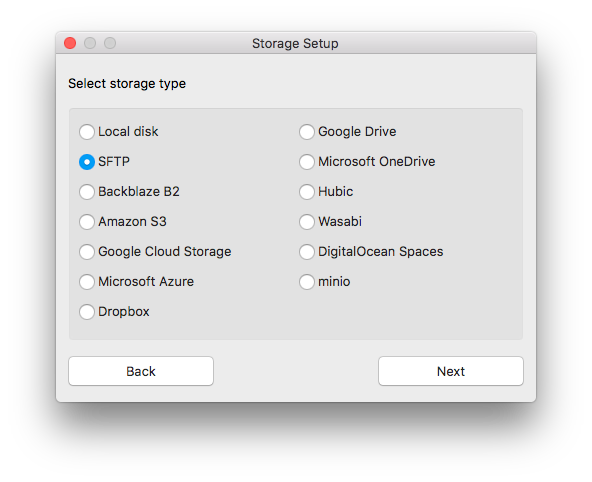 If the Prune snapshot after first backup checkbox is checked, Duplicacy will run the pruning operation after the first backup of the day or the manual backup. Please note that if there are multiple Duplicacy instances running on different computers that back up to the same storage, only one Duplicacy instance can have the pruning option enabled. Other checkboxes allow you to set up email notifications after each backup finishes, or to set Duplicacy to automatically start when you log in. On Windows, you can also take advantage the Volume Shadow Copy service to properly back up files opened by other processes. 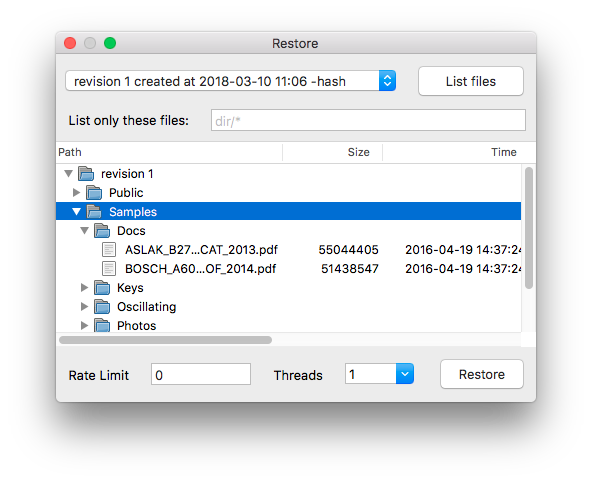 Right clicking the file or directory in the file list will bring up the restore action menu. There are two actions you can perform on each item in the file list. For a file there is a View action that can open the file in a text viewer. For a file or directory there is also a Restore action. You can also limit the download speed by entering the maximum kilobytes per second permitted into the Rate Limit text field, while a 0 indicates that no rate limiting is in place. Duplicacy doesn't support restoring files directly to a directory outside of the repository. If you need to restore files to a different directory on the same computer, or to a new directory on a different computer, you must create a new repository using the destination directory, and the same storage, following instructions mentioned above, but remember to not use the default repository id automatically generated by Duplicacy. 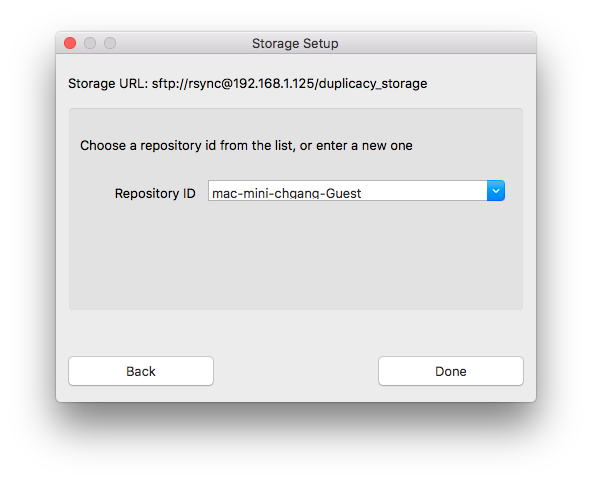 Rather, on the storage setup dialog, pick the id of the original repository from the dropdown list. Once the new repository has been properly configured with the correct repository id, you will be able to select files from the original repository to restore. Once installed, you can run Duplicacy as administrator to set up the repository, storage, backup schedule, etc. After you exit the Acrosync program, the service will take over and run scheduled backups at the given times. Note that if you run Duplicacy without elevated privileges you will be unable to control or configure the Duplicacy service. 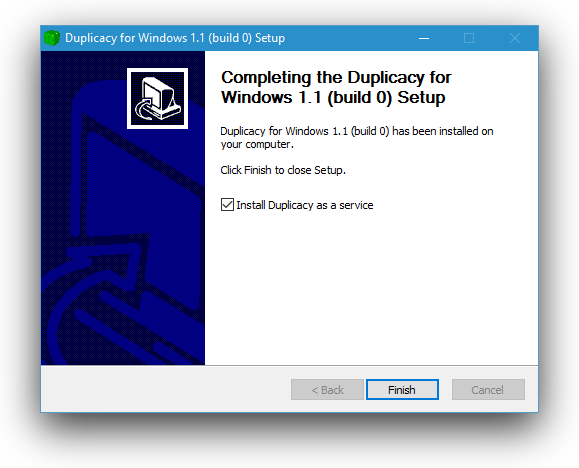 As a result, Duplicacy will not allow you to back up the same repository used by the service to avoid possible conflicts. If Duplicacy is already running without elevated privileges, you must also exit the current running instance by right clicking the system tray icon and selecting Quit. 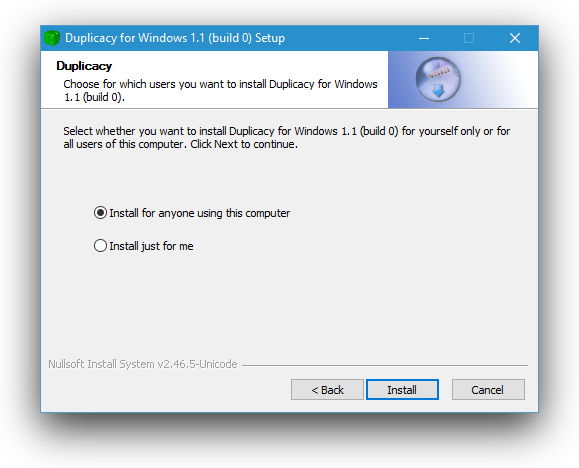 If you just close the Duplicacy window, it will remain running in the background, and when run Duplicacy as administrator, it will actually just bring to front the existing instance without elevated privileges. 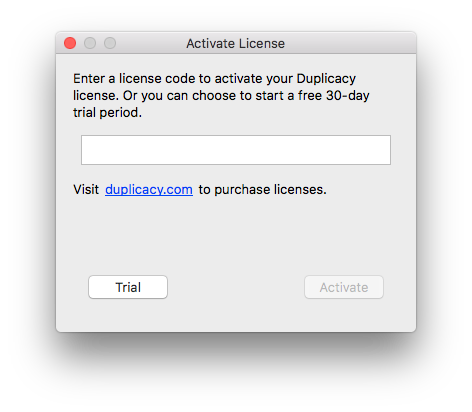 Duplicacy provides a number of advanced settings that can be configured via user defaults on macOS and registry values on Windows. These settings are stored under com.acrosync.mac.duplicacy on macOS, or HKCU\Software\Duplicacy on Windows (or HKLM\Software\Duplicacy if Duplicacy is installed for all users). The following lists the name of the user default or registry values for each setting. All registry values on Windows should be created as strings. Duplicacy creates HTTPS connections when connecting to cloud storages. Occasionally, it also contacts our license server via HPPTS to update licenses. If you computer can't access the Internet directly and instead relies on a proxy server, you can set this setting in the format of https://server:port to point to your proxy server. When Windows goes into sleep, Duplicacy will always attempt to wake up Windows on the next scheduled time. You can set this registry value to 1 to disable this behavior. By default when the computer just wakes up from a sleep, Duplicacy will wait 10 seconds before running an overdue backup. However, you can change the wait time to any value by changing this setting. If this setting is 1, Duplicacy will not show the main windows when it starts up. This is where Duplicacy stores the license. You can delete this user default or registry value and run Duplicacy again to update the license. This is usefully when you need to move a license to a different computer or remove an expired license.